"Hindsight is 20/20" — it's a cliche adage, but it's pretty accurate when it comes to moving! It seems that you always wish you organized differently, planned more, or simply had an easier way to navigate the moving process. Luckily, we've got you covered! 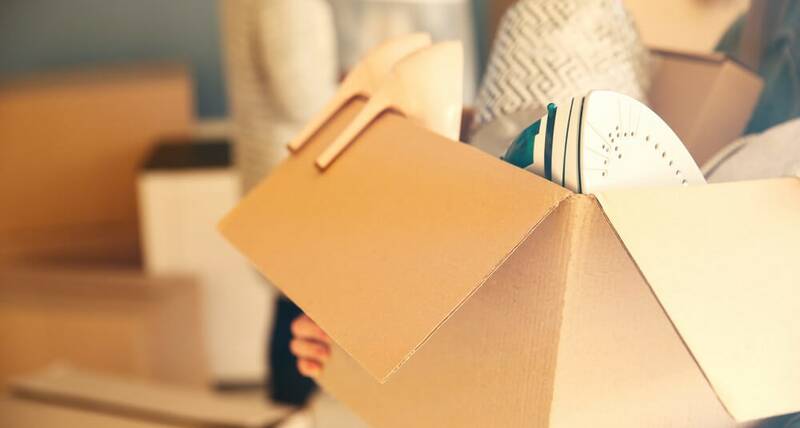 These 50 hacks are the most comprehensive guide to staying ahead of moving woes. Designate a donate pile for all clothing and items that you don't want to take with you. That way, all you have to do is schedule a pickup with the Salvation Army or ClothingDonations.org. Don't forget to ask for a receipt to claim a tax deduction! Schedule your move for the middle of the month or the middle of the week to cut costs. It's cheaper to move then! If you're renting, take photos of your old place as you move out and photos of your new place as you move in. Remove any dents in the carpet that furniture left behind with ice cubes. Simply place the ice cubes on the dents, let them melt, and use a spoon to lift the fibers. Use white Ivory soap, toothpaste, and other items to fill nail holes in your walls. Broken glass on the floor? Use a slice of bread to pick up the pieces that your broom missed! To make picture frames more stable and protect your walls from scuffing, cut off pencil erasers and glue them to the back of the frame before hanging it up. Wrap a rubber band around a hammer to prevent scuffing the wall when removing nails. To get stains out of the carpet, use a mixture of 1 part hydrogen peroxide and 2 parts water. Add some lemon essential oil to the mixture, shake lightly, spray the area, and let set for a minute. Scrub with a scrub brush, and voila — good as new! If you have scuff marks on hardwood floors, cut a hole in a tennis ball, stick the ball on the end of a broom, and rub the scuff mark until it disappears. Ask local retailers and businesses for their gently used boxes. Protect fragile items with magazines and newspaper instead of packing peanuts. Beware of the ink! While your clothes are still hanging in the closet, put them inside a trash bag to make unpacking simpler. Use laundry baskets, trash bins, and suitcases as boxes. 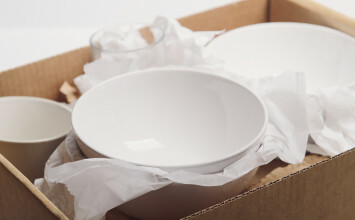 In lieu of bubble wrap, protect your dishes and fragile items with clothing and linens. Put stemware and glasses inside clean socks for extra padding. As you dissemble furniture, keep all screws and hardware in a plastic bag. Label the bag and tape it to the furniture itself, or designate a separate box with hardware for all your furniture. Use colored packing tape like Smart Move Tape to keep your boxes organized. Be sure to label which room the box belongs to! Write the contents of each box on the box, or on an inventory list. If you're feeling tech savvy, create an Excel document that tracks the contents of each box. Simply search for the item that you need in the document, and you'll know which box to open! If you use plastic wrap, you can leave your items in whichever container or storage bin they're in. For example, simply wrap your utensils organizer with plastic wrap instead of letting your forks and knives run loose in a box! Label the sides of boxes so you can read the labels even when the boxes are stacked. Unpack your boxes by room to prevent constant back and forth trips around the house, especially if you have stairs! Invest in Space Bags to maximize your storage space and minimize your boxes. Fill up pots and pans with spices containers, dish towels, and other kitchen items to save space. Avoid nasty smells and leaks by defrosting your fridge completely the night before your move. If you're moving your refrigerator, wrap your refrigerator and freezer in plastic wrap to keep the doors from opening during transit. Snap a picture of the back of your TV and other electronic devices. That way, you know exactly which wires go where when you're setting up in the new place! Put knives inside an old oven mitt to prevent injuries. String electronic wires through paper towel rolls to avoid tangled messes. Use rubber bands to prevent getting locked out. String a rubber band around one door knob, then cross it over and wrap it around the door knob on the other side to keep the door from locking. Put jewelry in egg cartons to keep your necklaces from knotting and tangling. Place a cotton ball in makeup compacts to keep them from breaking. Use rubber bands to keep pots and lids together. Stack plates vertically (like you would in a dish rack!) to prevent them from breaking. For extra protection, put a styrofoam plate between plates. To keep toiletries from leaking during transit, put a piece of plastic wrap over the opening, then screw on the cap. Use a box cutter to create handles for your boxes. Buy cereal, milk, and other easy breakfast items so that there's food available the morning after moving day. If you're moving with kids, incorporate them into the moving process by giving them a special box for all their favorite things. Let them decorate the box as wildly as they like! If you're moving with a dog, put their food and water bowl in the same room as where you put it in the old place. The more consistent you are with your dog's routine, the less likely they are to be anxious and destroy things. 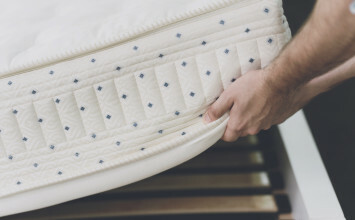 Keep all your moving day essentials in an overnight bag. It'll prevent having to sift through boxes to find your laptop, toiletries, clothes, and medications! Pack the items that you'll need most immediately in a clear plastic bin, or a designated "open first" box. Think: bed sheets, hand soap, towels, etc. Take a breather! Moving day is stressful, so allow yourself some "me time" when it's over. Watch a movie, order some pizza, or do whatever you need to relax after a long day of hard work. There you have it folks! 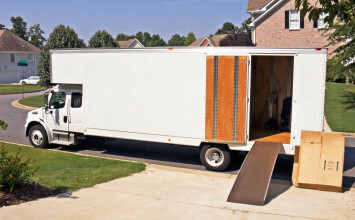 You've got 50 hacks to make the moving process hassle free.